grandma's cookie jar: What Did Your Grandparents Say? 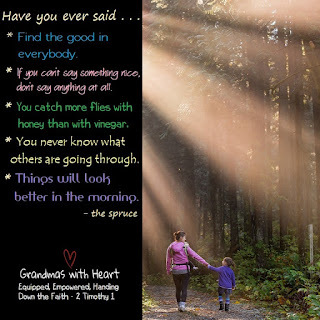 Yes, as grandparents we do tend to hand down wise sayings - which is fine, just be sure we are purposeful about also handing down the truth of Scripture! What old saying did your grandparents say to you - and do you find yourself saying the same thing to your grandchildren?